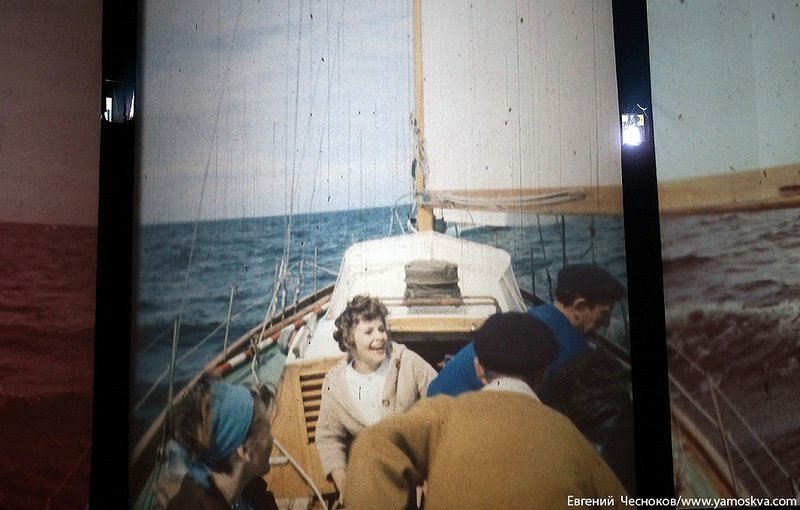 Celluloid Junkie can exclusively reveal that Christie Digital is planning to counter Barco’s tri-screen ‘Escape’ system, launched at CinemaCon, by resurrecting the ‘Polyvision‘ triptych format invented in the 1920s that predates Cinerama. 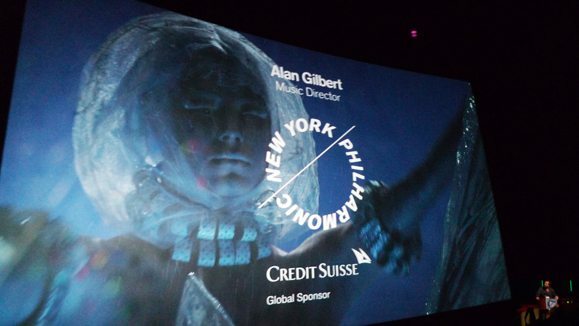 Though not formally announced yet, we understand that Christie’s Polyvision 2.0 will be used at NAB next week to show a digitally restored version of Abel Gance’s silent masterpiece Napoleon, which first used the format in 1927 for the film’s final battle sequence (see video above). This will be the ultimate immersive experience that will even leave Occulus in the dust. We’ve had tremendous interest already and fully expect Christie-Polyvision to overtake IMAX installations by this summer, when Napoleon will be re-released on a wide scale. We see the film as having the combined appeal of The Artist, Avatar and The Hobbit – not least given its five-and-a half-hour running time and unique digital 0.0 sound mix. Combined with the digital Polyvision 2.0 launch, Christie is expected to name the Honorary Academy Award recipient, film historian and archivist Kevin Brownlow as the company’s in-house ‘Retrologist’. My source tell me that Brownlow will dig through film archives and museums to uncover more cinema technologies of the past for the future. 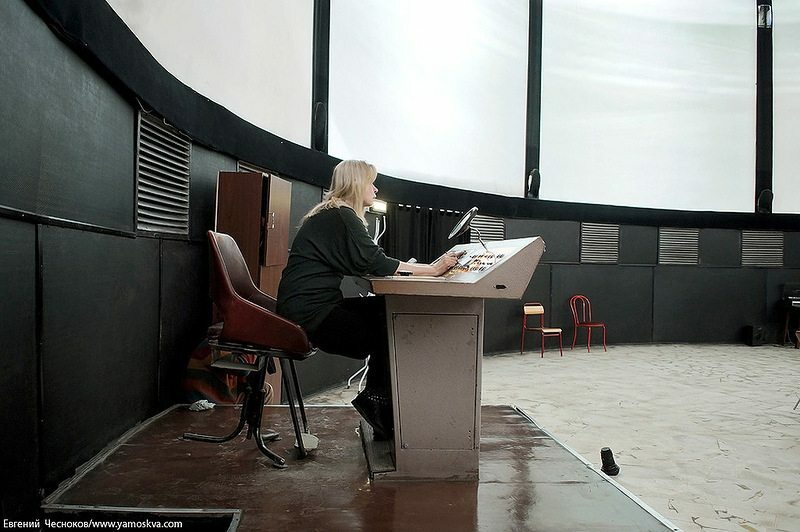 We understand that the development came after a protracted internal battle in Christie between those who favoured the digital triptych solution and others who favoured an Imax-size quad-screen solution, which would have been used to show Mike Figgis’ film Timecode (2000) all-year round. Mark this historic date in your calendar! Malaysia: No joke this one; a judge in Malaysia has given the go ahead for Malaysian cinema operators to challenge the ban from local film body to charge local film producers virtual print fees (VPFs). This has been going on since 2 October last year and creates a problematic precedent given Hollywood studios’ most favoured nation (MFN) clauses in most VPF agreements. The High Court(Appellate and Special Powers) granted leave to the Malaysian Association of Film Exhibitors(Mafe) to proceed with judicial review against the National Film Development Corporation(Finas) over Finas’ decision to prohibit Mafe from imposing virtual print fee(VPF) on local film producers. UK – Tomorrow (2 April) is World Autism Day and Vue Worcester and Bolton are two of (hopefully) many cinema that will celebrate it by hosting a special autism-friendly screening of Muppets Most Wanted with dim lights, low sound and no adverts. Robert Wilkins, general manager at Vue Worcester, said: “At Vue Worcester we are dedicated to providing all our customers with the best cinematic experience possible. UK: The head of UK’s largest cinema advertiser DCM talks about how ads can and should be as good as the films they precede, giving lots of examples of innovative campaigns. For it to work, the content has to be of the highest quality and there is nowhere more exposed than the big screen where work is played to the same technical excellence as movies that cost $1.3 million a minute to make. UK: DCM has also launched an automated advertising system in 150 cinema locations (subscription required for full article). Not sure if this is news. India: PVR may be getting more attention, but Inox is also forging ahead with new multiplexes in India. USA: Who on earth decided to schedule the Giant Screen Cinema Association’s Film Expo (March 24-25) the same week as CinemaCon (March 24-27)?? For those of you who didn’t make it to the latter event in Austin, TX, there is an excellent report on it (and SXSW) by David Keene. Well worth reading for more than just Large Format news and updates as it touches of HFR and event cinema. IMAX film is the holy grail of cinema if you love the highest resolution, most lush, most detailed images in all their big-screen glory. It’s not all film (celluloid) today, but it’s the last bastion of celluloid. And if you love “1570” (15-perf/70mm film-based format), enjoy it while you can. Last October IMAX announced that it accelerating the transition to digital in its theaters. 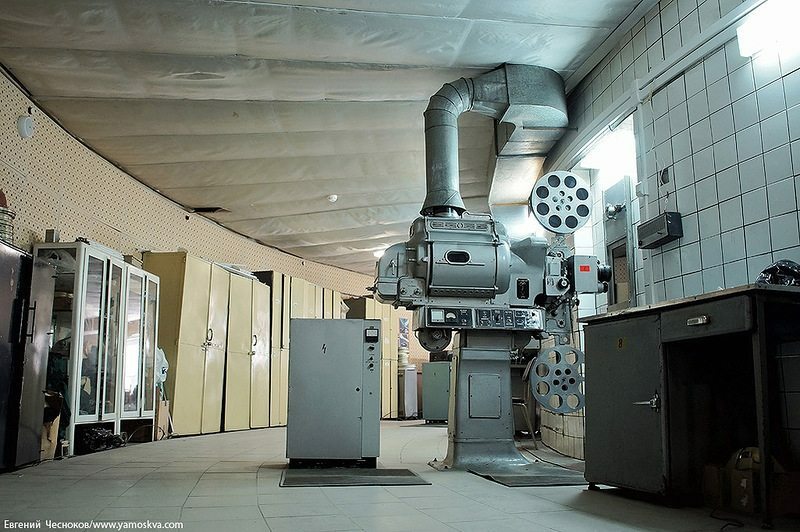 There are now only about 170 film-based theaters in the Imax network worldwide. About 20 of those are commercial movie theaters that concentrate on showing mainstream Hollywood movies. 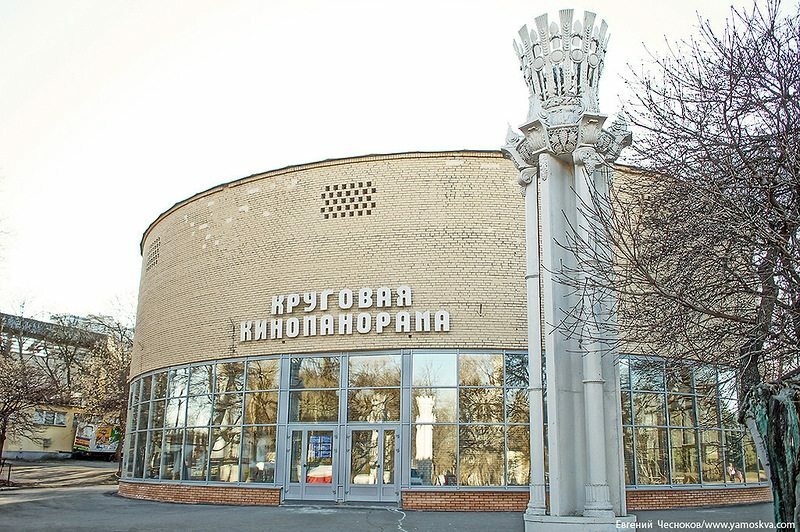 That leaves about 150 IMAX theaters that are associated with institutions, mainly museums. New Zealand: A letter to the editor of the Otago Daily Times. 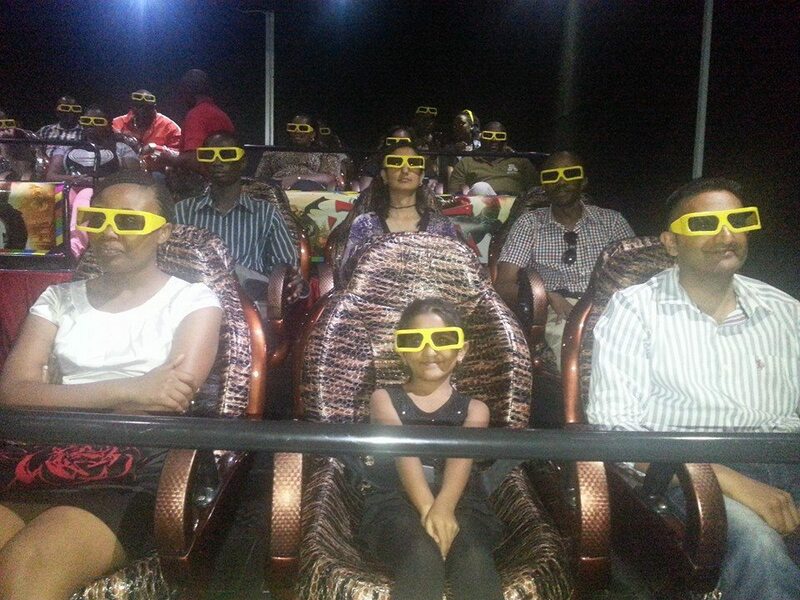 I took a group of children to see Mr Peabody and Sherman at the Rialto Cinema on Saturday afternoon. The foyer was busy with parents and children of all ages, sitting in the foyer, waiting to go into the theatre. UK: Screen Daily looks at the success of Secret Cinemas’ The Grand Budapest Hotel pre-release and screenings and what’s in store for the future. Vatican: The beatification ceremony of John Paul II will be captured in 3D and 4K Ultra-HD and transmitted to television and cinemas across the world. The 3D production will be produced by Sky Italia and U.K. facility company Telegenic. Six stereo pairs of HD cameras and three additional HDCam cameras converted on the fly will be deployed. The pride of this country in variety of roles Prakash Raj came very clear on remake and dubbing at the ‘Oggarane’ Kannada film audio launch at Gold Finch Hotel in Bangalore on Saturday night. USA (NE): Councilors in Lincoln are set to repeal a 1949 city ordinance that restricts alcohol sales in places that allow minors after 9pm, opening the door for Marcus cinemas to open a cinema bar. The council’s Internal Liquor Committee has no objections to the repeal, said Council Chairman Carl Eskridge after the meeting. The committee is looking at other options, but Eskridge said he didn’t know if they would come up with a replacement ordinance. Firefly Cinemas launched Wellington’s first drive-in cinema this summer. To see the end of their season off with a bang, they are showing Back To The Future One & Two back-to back on April the 13th, at Trentham Racecourse. UK: The Brixton Ritzy has banned the April edition of the local paper, for carrying front-page news about the labour dispute in the cinema. The film theatre’s manager, Rob Belfield, removed all copies of the newspaper from the foyer on Friday, because of a front page article about the campaign for a ‘living wage’ for staff at the Picturehouse Cinemas-owned theatre. A ballot of BECTU union members over strike action closes today (Monday). It was triggered when bosses at Picturehouse Cinemas refused a pay increase for all staff in line with the London Living Wage (LLW), currently £8.80 per hour. USA (VA): One of the world’s smallest cinemas (20 seats) now also holds a record for one of the fastest closures. 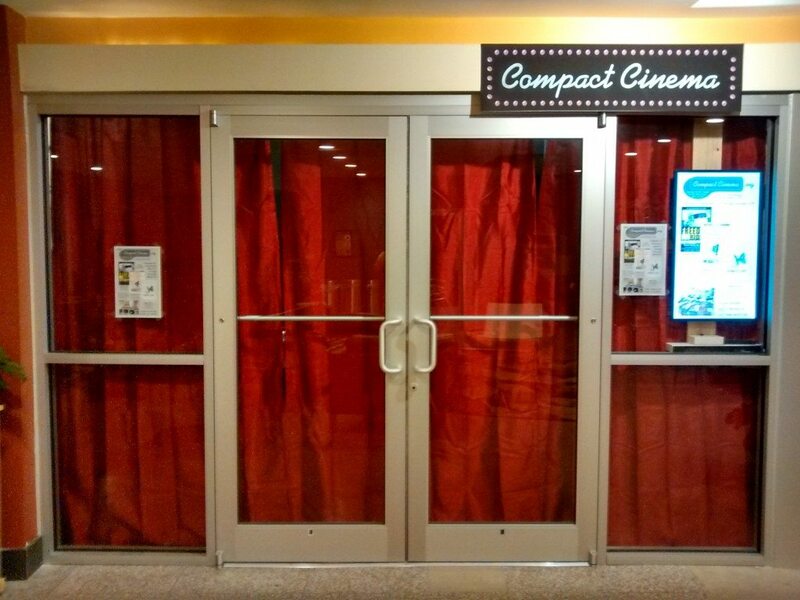 Compact Cinema, a small independent theater in 16 West Marketplace, closed on Saturday after less than a month of business. 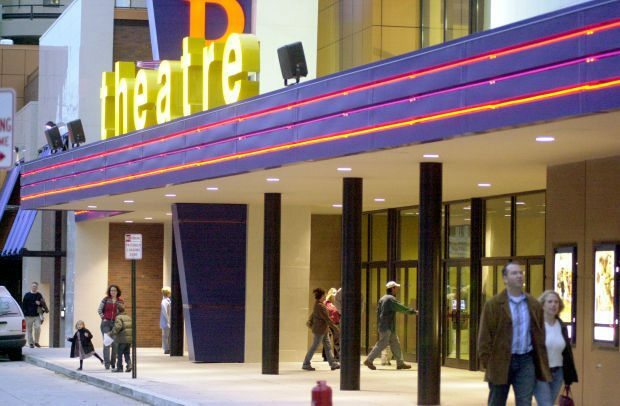 Owner Ben Bristoll said there were not enough customers to sustain his business model for the theater, which mostly showed hard-to-find documentaries at a reduced rate. Hats off though to Ben Bristoll for trying. There are plenty of empty shopfronts in the US that could do worse than to have a micro cinema. 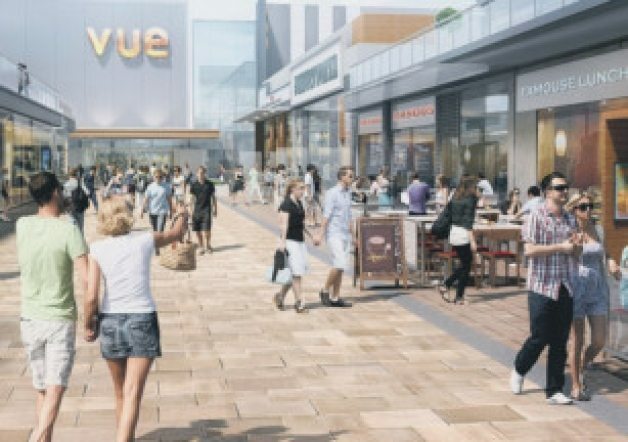 UK: Vue and Savoy Cinemas have both set their sights on Corby, with the latter due to face the local council today. One of two rival cinema schemes in Corby will be in the spotlight next month when the company behind the project seeks planning permission from the borough council. 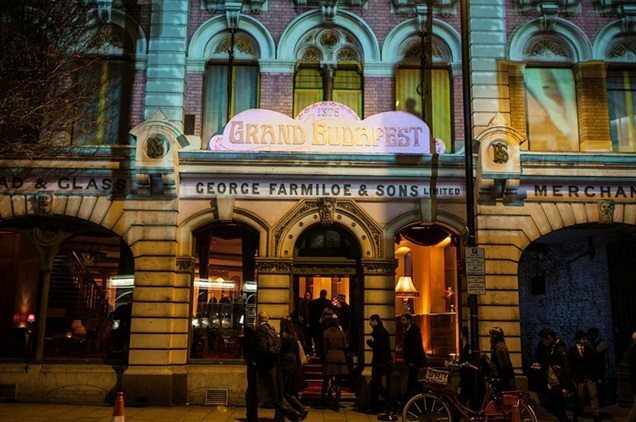 UK: North London gets its own trendy cinema in Crouch End. Everyone has been raving about the Olympic Studios in Barnes, now it’s our turn in North London. 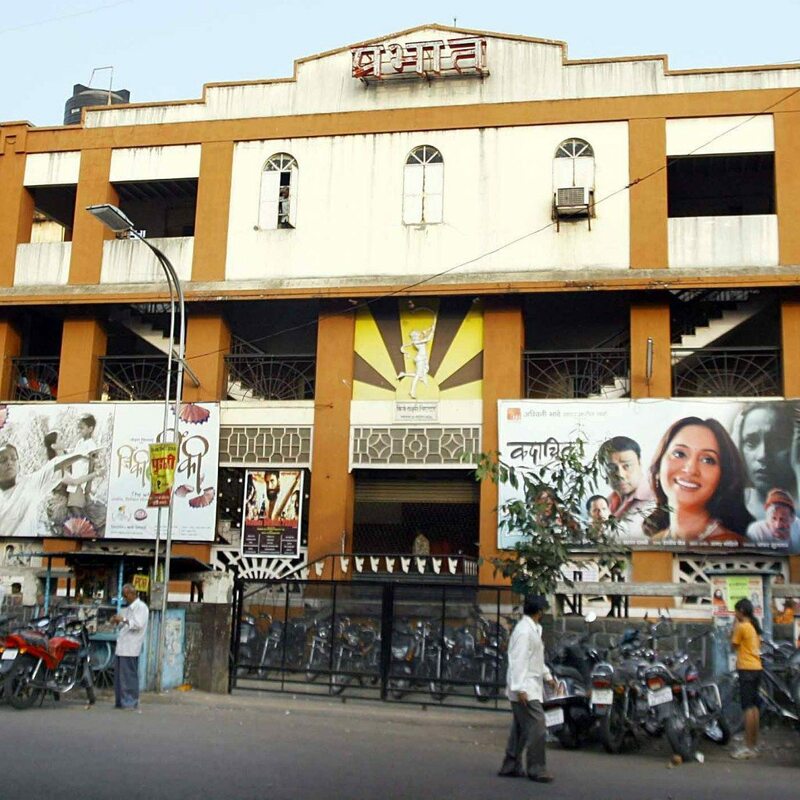 India: After yesterday’s news of the closure of Mumbai’s gorgeous New Empire picture palace, the Indian press is going all sentimental about single-screen cinemas. Somebody better put together a coffee table book of photographs of them before they are all gone. UK: A ‘grotty’ former ABC cinema is said to have cost Tunbridge Wells its Royal prefix. We expect the crisis to be resolved by April 2nd. Although the process could take up to 18 months, the Courier understands there has already been a meeting between Tunbridge Wells Borough Council and Buckingham Palace aides. The move is likely to cause outrage in Royal Tunbridge Wells which is proud of its royal title, given in 1909 by King Edward VII. UK: File this story about the Brixton Ritxy cinema to be converted to a Little Waitrose supermarket under What Day Is It? Waitrose spokesperson, Joe King, said: “Brixton is a buzzing, vibrant part of south London that is a venerable melting pot of culture, and it is fast becoming a real foodie haven. 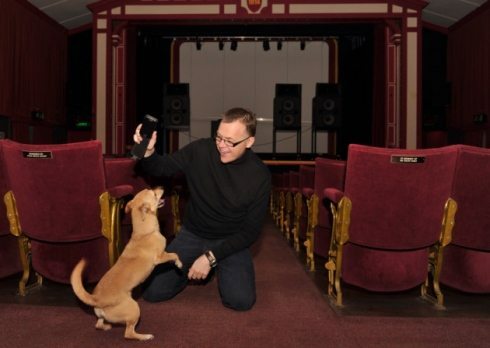 UK: Trained mobile phone dog sniffer to be deployed in Leiston cinema. (If only). Pip, who played Toto in ‘The Wonderful Wizard of Oz Pantomime’, has decided to put her nose to the floor to help prevent the use of mobile phones and other electrical gadgets during films as a fully trained ‘sniffer dog’. Having recently taken off her acting hat, Pip decided that crime prevention was the way forward and enrolled in an intensive mobile phone training course especially for theatres and cinemas. OK, so Escape/Cinerama/Polyvision are not exactly new concepts. 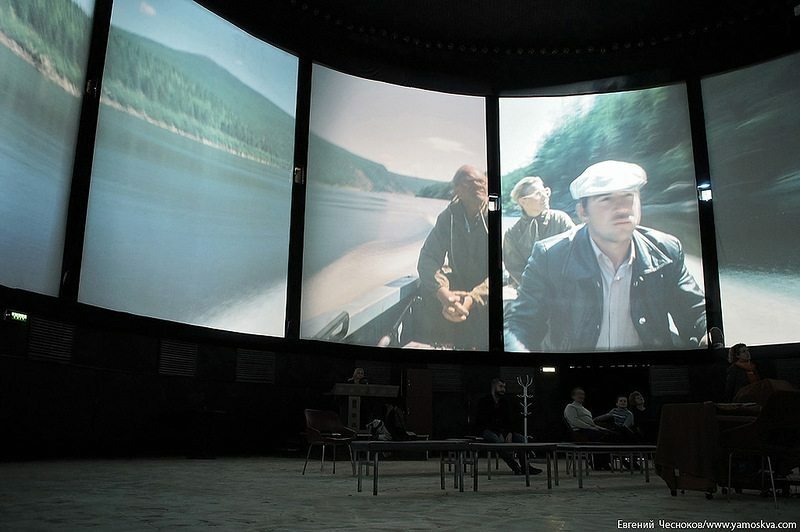 But did you know that there is still a cinema in Russia that shows completely immersive films? The article has some amazing pictures of a super cool vintage technology. Maybe Sony might be interested.